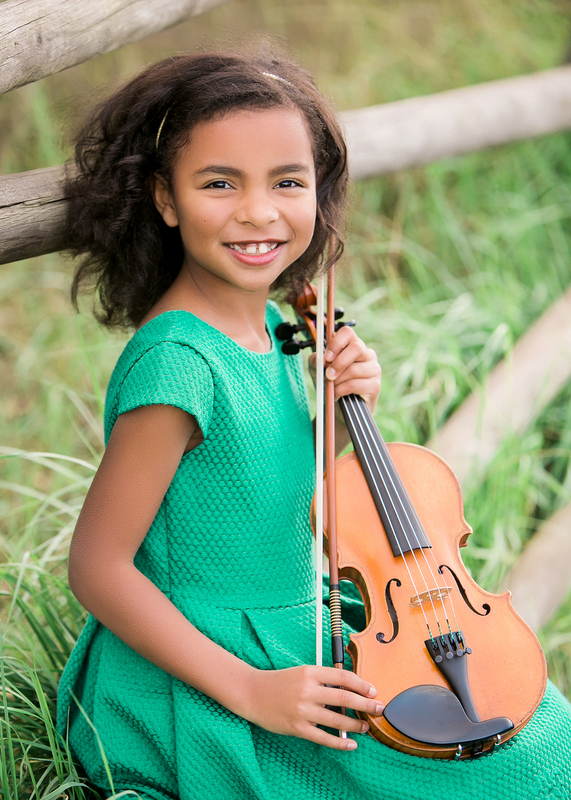 Aspiring young violinist Amaryn Olmeda, age 9, began playing the violin at 4 years old. She is a student of renowned violinist and educator, William Barbini. Amaryn made her performance debut at the Colorado Suzuki Strings Institute in Beaver Colorado at the age of 6. Since then, she has gone on to win first place in her division for the Auburn Symphony Young Artists Competition, the Music in the Mountains Young Musicians Competition, the Classical Music Masters at the Harris Center for the Performing Arts, the Sacramento Youth Symphony Academic Orchestra Concerto Competition, the Pacific Musical Society Competition in San Francisco, and the Sacramento Section of the American String Teachers Association Solo Competition. In addition to her solo endeavors, Amaryn is a member of the Sacramento Youth Symphony and participates each year in their Summer Chamber Music Workshop. Amaryn enjoys performing for her community by caroling on her violin for house-bound church members and at nursing homes. She enjoyed participating in the Sacramento Youth Symphony Academic Orchestra School Tours program, where she was the featured soloist for performances at schools in the Sacramento area. She has performed at several Davis Community Church weekly Luncheons for the Homeless and for the Children for Children Showcase Concert to benefit the Child Advocates of Nevada County. Amaryn also loves collecting American Girl Dolls, attending art classes, knitting and sewing. She homeschools on her family’s hobby farm in Loomis, California, where she enjoys caring for animals and family gardening.